The apartment is located in the heart of Firostefani. Very close to landmarks and caldera. The apartment is only 20 meters away from Saint Grasimus church, 50 meters from Caldera, restaurants, bars and coffee shops. In close proximity you will find a public parking area, mini markets and bus stop connecting Firostefani with Fira and Oia. Fira, the capital of the island is at about 700 meters away. Firostefani apartment Krystalia consists of two bedrooms and a bathroom with shower and washing machine. The apartment offers also a small living room and a fully equipped kitchen.The apartment can accommodate up to 5 persons. The first bedroom offers a double bed, an open closet, tv and AC unit. There is also a safe available so you can keep your valuables locked and safe. The second bedroom offers two single beds (that can be pushed together and form one double bed if necessary), a TV and an AC unit. One more person can be accommodated in the living room, on the built in sofa. The built in sofa bed is actually a single bed so the 5th person will be comfortable enough. The kitchen is fully eqquiped with pots, pans and dishes, glasses and cutlery. There is an electric stove, a fridge, coffee maker, toaster. Everything in short a family or a group of friends needs in order to prepare a tasty dinner. There is also complimentary wifi access and a washing machine. The apartment does not offer caldera view (caldera is just a few steps away) but there is a a balcony equipped with a table and chairs where you can relax after a day of exploration. Please note that the terrace is shared with the next door apartment (Sofia).There is a bus stop at about 20 meters away that connects Firostefani with Fira and Oia. A mini market is just accross the street. Retaurants, bars, coffee shops are at about 50 meters away. 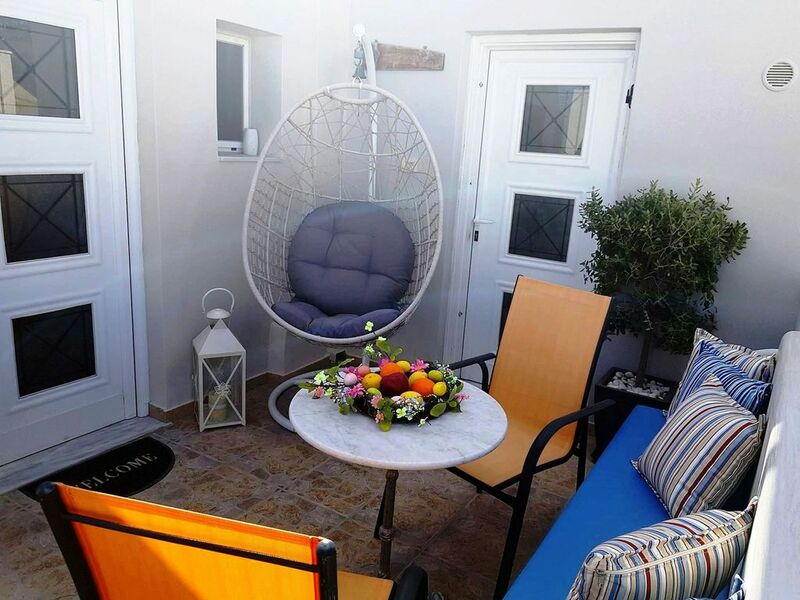 Its location is ideal for families or friends who want to enjoy the vibratious Santorini but avoid the hustle and bustle of the touristic areas.